PID control as we all know is a fundamental thing used in process automation. For PID control we generally use PID Controller, but in Omron PLC there is one exclusive instruction for PID purpose. This instruction is very helpful in many application where we can minimize cost by using software PID inside PLC. In this post, we will see that how to use this PID Instruction in Omron PLC. Omron PLA is very popular in the Automation industry and used in a wide range of applications. Omron PLC have exclusive feature that we can create a PID inside PLC by using an PLC Instruction. The name of PLC instruction is PIDAT. Where S is the Input word, C is the control/Parameter Word and D is the first output word. When the input condition of this instruction is on then it performs the PID control on the bit in word S according to the control word C. The different bits of Control word C defines the PID process parameters. Let us see the meaning of each bit of control word C. The word C defines the target value of the process being controlled. C+1 defines the proportional band i.e the parameter for P action expressing the pro­portional control range/total control range. C + 2 defines Tik Integral Constant, a constant expressing the strength of the integral action. As this value increases, the integral strength decreases. C+3 stands for Tdk Derivative Constant, constant expressing the strength of the deriva­tive action. As this value increases, the derivative strength decreases. C+4 stands for the sampling period, the sampling period can be designated in units of 10 ms (0.01 to 99.99 s), but the actual PID action is determined by a combination of the sampling period and the time of PID instruction execution (with each cycle). 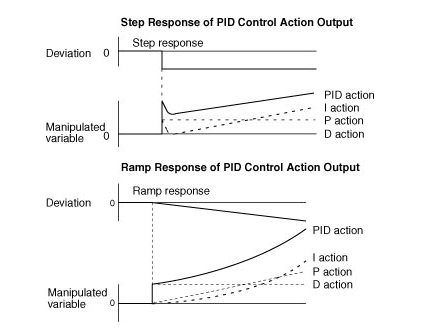 Below is the diagram explaining PID action. 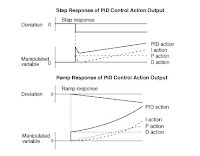 PID action combines proportional action (P), integral action (I), and derivative action (D). It produces superior control results even for control objects with dead time. It employs proportional action to provide smooth control without hunting, integral action to automatically correct any offset, and derivative action to speed up the response to disturbances. This instruction is very useful for PID block creation. Dont forget to subscribe to get all latest updates. Subscribe to Automation-Talk by Email.